I am an Assistant Professor (since April 2013) in the Department of Computer Science & Engineering at IIT Kharagpur, India. Prior to that, I worked briefly (Aug. 2012-March 2013) with Samsung Electronics, Noida as a Chief Engineer. I received my Ph.D in Computer Science & Engineering from IIT Kharagpur under the supervision of Prof. Niloy Ganguly and Prof. Sujoy Ghose. I did my first postdoc (May 2010-June 2011) at the French National Centre for Scientific Research (CNRS), Paris, France and second postdoc (July 2011-July 2012) at the Universite catholique de Louvain (UCL), Belgium. 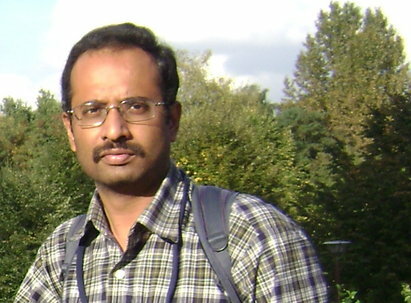 I am also associated with the Complex Networks Research Group (CNeRG), IIT Kharagpur, India. New paper in IEEE Transactions on Computational Social Systems: "Temporal Sequence of Retweets Help to Detect Influential Nodes in Social Networks" with University of Namur and Universite catholique de Louvain, Belgium. New paper in IEEE Transactions on Affective Computing: "Designing An Experience Sampling Method for Smartphone based Emotion Detection" with Georgia Southern University, USA. New paper in Computer Communications: "Listen to Me, My Neighbors or My Friend? Role of Complementary Modalities for Predicting Business Popularity in Location Based Social Networks". New paper in IEEE Percom 2019: "Avoiding Stress Driving: Online Trip Recommendation from Driving Behavior Prediction". Received NetApp Faculty Fellowship (NFF). Media coverage here. New paper in PAKDD 2019: "On the Network Embedding in Sparse Signed Networks". New (short) paper in ACM IUI 2019: "Does Emotion Influence the Use of Auto-suggest during Smartphone Typing?" with Georgia Southern University, USA. New paper in IEEE TMC: "GroupSense: A Lightweight Framework for Group Identification". New paper in ICWSM 2019: "On the Migration of Researchers across Scientific Domains" with Northeastern University, USA. New paper in IEEE BigData 2018: "Constructing Influence Trees from Temporal Sequence of Retweets: An Analytical Approach". New (short) paper in ACM SIGSPATIAL 2018: "Mining Spatio-temporal Data for Computing Driver Stress and Observing Its Effects on Driving Behavior". Two poster papers in ACM MobiCom 2018. Organizing Doctoral Symposium@ICDCN 2019, Bangalore, Jan 2019. Submit your proposals! Organizing Dynamics on and of Complex Networks XI (DOOCN 2018), A satellite workshop of CCS 2018, Thessaloniki, Greece, Sep 2018. New paper in IEEE GLOBECOM 2018 : "An Unsupervised Model for Detecting Passively Encountering Groups from WiFi Signals". New paper in ACM RecSys 2018: "ComfRide: A Smartphone based System for Comfortable Public Transport Recommendation". New paper in Journal of Data Science and Analytics: "Easy-Mention: A Model Driven Mention Recommendation Heuristic to Boost Your Tweet Popularity" with University of La Rochelle and UPMC Paris, France. New paper in PAKDD 2018: "GBTM: Graph Based Troubleshooting Method for Handling Customer Cases Using Storage System Log" with NetApp. New paper in IEEE INFOCOM 2018: "ADELE: Anomaly Detection from Event Log Empiricism" with NetApp. Open Positions: Ph.D/MS positions are available in the areas of (1) Complex networks/Social networks (mostly theoretical/analytical and real data driven research) and (2) Mobile Systems (mostly experimental research). Highly motivated candidates with strong academic background (B.E./B. Tech with high CGPA, preferably with an M.E./M.Tech in CS) are encouraged to contact for the positions (drop me a CV). Internship: I do not encourage students to spend their second year vacations doing summer projects. So do not expect any response from me. Third year students, if you are interested, apply via link . Please do not send me any mail, neither expect any reply. The staff responsible for that will send you a reply in due time.